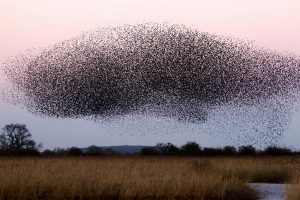 Perhaps you’ve seen a murmuration in real life or on television. It is when a group of birds (typically starlings) move in synchrony. Google it – the images are fascinating. When humans work together for a common cause it can be equally as beautiful. The mission of AmpleHarvest.org is to connect backyard gardeners with local food pantries and we could use a murmuration of volunteers to help us connect with more food pantries and gardeners. Type in your address and see what pantries come up. Make a plan to visit the pantries that are listed in your community. Tell them you found them on AmpleHarvest.org and you wanted to make sure all their information is correct so that gardeners can connect with them during the upcoming growing season. Thank the food pantry for all they do and if you are able, supply them with this flier to display in a prominent place so more people know they can donate fresh produce donations. If you don’t see a food pantry in your community listed on our site, encourage them register! Help us spread the word. Hang these fliers in garden centers, greenhouses, community centers…anywhere gardeners will be frequenting in the next few months as we get ready for the growing season. The fliers will let them know that when they have an abundance of fresh fruits and veggies from their garden, they can turn to AmpleHarvest.org to connect with their local food pantry. Your time and commitment to helping us address hunger in your community is invaluable and we couldn’t do it without you. Thank you for volunteering to help AmpleHarvest.org!